Some types of shoe laces are more prone to getting unlaced than others, and sometimes using the wrong knot for the wrong laces can cause the annoying unlacing to occur much too often than you would prefer. Thankfully, there are some simple tricks and tying methods so you know how to keep shoe strings tied. The best way to keep the laces of you sneakers nicely tied is to tie small knots at the end of each shoe string. The knot will stop the laces from slipping out of the eyelets, which we all know can be very annoying especially if you are running, let alone racing. Also, you can double tie the laces with a double knot and tuck the loops of the knot underneath the laces, so that they stay intact at all times. If you are willing to try out some of the more complicated lacing and knotting techniques, you can view a video or read the instructions for tying a highly effective Ian knot or another one of the various shoe lace knotting techniques available on the Internet. The truth is that even with the best known tying method – the so called Granny knot, you can keep your shoe strings tied, but the trick is to tie them in a balanced fashion with even loops on both sides of the shoe. If your laces have become stretched or are worn, they are more likely to get untied in the wrong moment, so the best thing to do is to replace them. Leather shoe laces such as these of men’s work boots can be very slippery and difficult to keep tied, so there is a very simple thing you may do to help keep the knot of the leather laces properly tied. Take the string off of the shoes and wet them thoroughly. Dry them with a blow dryer. The heat will help dry them up and you will find that tying them and keeping them tied after that will be much easier. If you don’t want to dry them, simply lace them back on your shoes and wear them wet until they dry naturally. This should do the trick too! 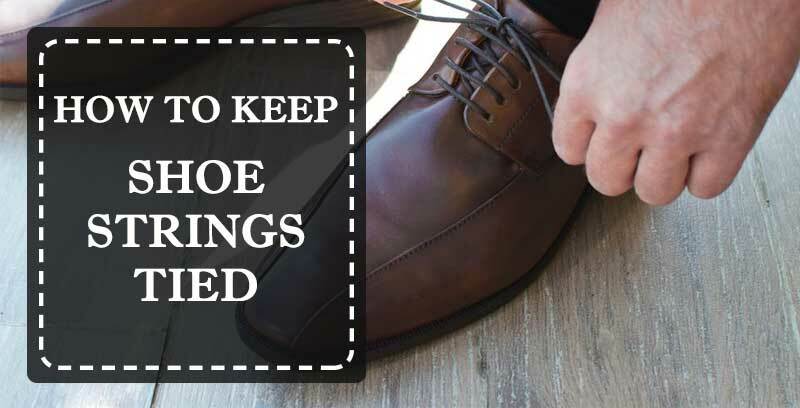 If you are willing to try out some of the fancier tying techniques, you can try out the Boat shoe knot, also known as the Corkscrew knot, which is highly efficient for keeping leather laces tied firmly. Round shoelaces such as those of some travel shoes are really nice, but are a pain to tie properly, because they tend to be slippery and to get untied more often than other shoelaces. The best tip to resolve this problem is to wax them with some candle or beeswax. The waxed round shoelaces will stay tied securely for longer. To make sure that the laces stay tied, you can also do the double knot by making two loops from the two ends of the laces and crossing them by pulling them both through the middle hole of the knot. This is a very secure shoelace tying knot, suitable for round and for all other shoelaces as well.